I'm finding this a bit monotonous. I carded all the Romney. I carded all the Bruno. I carded 12 little baggies. The baggies were the worst. So as not to overload my hand cards, I split the contents of each baggie into 4 roughly equal parts. Card, card, card, card. Then I stacked each of those parts on top of one another and split it into 4 again. Card, card, card, card. If it didn't look quite homogeneous, I did it a 3rd time. Card, card, card, card. Now in case this is looking extremely bleak, please note that the baggies containing 100% Bruno, didn't need to be blended as it's all the same lovely black. The baggies containing 100% Romney did need to be blended as some of the locks were darker and for the gradual color changes, I didn't want it to start light, get darker, go light again before spinning the next baggie. So I guess that's only 10 baggies... card, card, card, card. 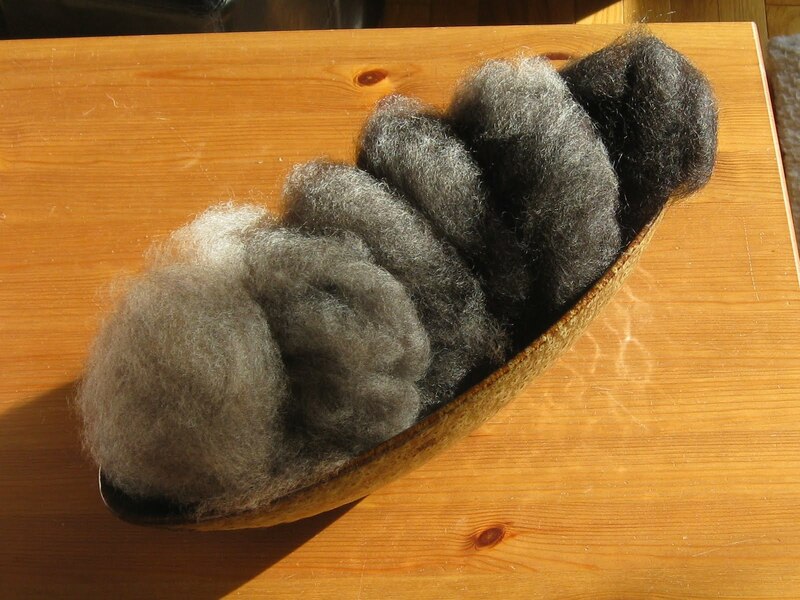 So here is one of the two batches of blended fibers.